Extracted deep from within the depths of a cockney diamond geezer mine in Canning Town, Reg Varney epitomised the cheeky chappie character years before David Jason strolled into town as Del Boy. And, as perennial bachelor boy Stan Butler, Varney endeared himself to the majority of the British viewing public in On the Buses. It was a sitcom which managed to rack up 76 episodes and made his name, but what would Varney's next step be? Well, the answer came in Down the Gate which aired between 1975 - 76 on ITV. Swapping London bus garages for the hustle and bustle of London's Billingsgate fish market, Down the Gate is the type of right cockney knees up sitcom which is perfect for Varney's barrow boy charms. It's also packed full of your archetypal 70s sitcom dolly birds, so it doesn't take long to get to grips with the show's format. Essentially, Down the Gate sees Varney playing Stan Butler projected through a prism of fishmongering, so, yeah, it doesn't really push him in any new or weird directions. In fact, the whole thing is pervaded by a derivative nature, especially when viewed through modern eyeholes. However, I don't want to come across as some curmudgeonly sitcom snob, so I'll happily sing the praises of Reg Varney's presence. There's always a measured brilliance to his performance and, in Down the Gate, his Bow Bells charm manifests itself as being insanely likeable. It's difficult, therefore, to explain Down the Gate away as 'just another sitcom'. Forever known as the nagging yet sensible half of the Fawltys, Prunella Scale certainly made her mark in the sitcom world with Fawlty Towers. However, people seem to forget about her lead role as Dolly in BBC sitcom Mr Big. Starting off as a one-off Comedy Playhouse episode in 1974, Mr Big went on to secure two series of its own in 1977. Mr Big centred around the illicit activities of Eddie (Peter Jones) who sees himself as somewhat of a criminal mastermind. Unfortunately, he's somewhat lacking when it comes to building a crew of seasoned criminal acolytes to help put his nefarious crimes into action. Instead, he has to muddle through with his immediate family: Dolly (Prunella Scales), Ginger (Ian Lavender) and Norma (Carol Hawkins). And, naturally, they're a right bunch of amateurs when it comes to swindling bookies, their neighbours and even sheiks. Although the pilot aired before series 1 of Fawlty Towers, the full series of Mr Big aired in between the first two series of Fawlty Towers. Due to the bulldozing longevity of that sitcom's presence, it's no surprise that Prunella Scales' other ventures of the era were forgotten. However, by taking on the role of a ne'er do well with a penchant for shoplifting, it's an interesting departure for Scales. Mr Big was never repeated and the lack of commercial releases have rendered it as rare as hen's teeth. Robert Lindsay's glittering career has taken in several different genres, but perhaps two of his best known roles saw him popping up in the sitcoms Citizen Smith and My Family. And, despite all the Olivier awards, even a Tony award, he's probably most synonymous with these comedy roles than anything else. What's forgotten, though, is his lead role as Pete Dodds in early 80s BBC sitcom Seconds Out. Managed by Tom Sprake (the ever brilliant Lee Montague), Pete Dodds is an amateur boxer with plenty of talent, but more concerned with larking around in the ring. To get Dodds focused on the crucial aggression needed to come up trumps in the ring, Sprake hooks Dodds up with a new trainer, Dave Locket (Ken Jones). In true sitcom fashion, Dodds and Locket's mutual hatred pays dividends when it comes to attaining the necessary frisson of aggression not just for laughs, but also for Dodds' success in between the ropes. 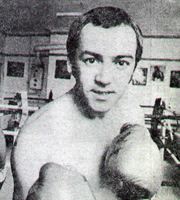 Seconds Out is an interesting role for Robert Lindsay which dismisses any preconceptions of his range borne from the strong focus on Wolfie Smith and Ben Harper; it's a testament to Lindsay's talents that he manages to seamlessly integrate himself within the testosterone fuelled world of boxing. And when it's all backed up by fantastic supporting actors, you start to realise that something special lies at the show's heart. Never released commercially, Seconds Out has, rather unfairly, been forgotten amidst Lindsay's myriad glory. Nonetheless, it's a fantastic footnote to Lindsay's career, so I don't think it's a case of hyperbole when I claim it's an absolute travesty that the world's been deprived of a commercial release. The antics of Hyacinth Bucket haven't just tickled my funny bone over the years, they've tickled the entire globe's funny bone. 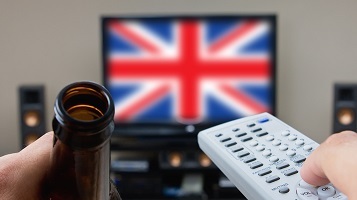 Yes, that's right, Keeping Up Appearances is the UK's most successful sitcom export ever. Bigger than The Office and bigger than Fawlty Towers. One of the reasons it's been able to muscle it's way into pole position is thanks to Patricia Routledge's performance which perfectly encapsulates the social heirarchy and aspirations of Britain. It wasn't Routledge's first lead sitcom role though. 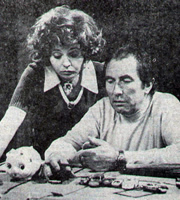 The catalyst for her future success had been sparked a few years previous in 1985 with the ITV sitcom Marjorie and Men. 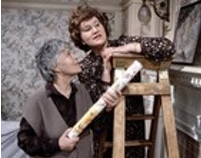 It's a series which sees divorcee Marjorie Belton (Patricia Routledge) having to suffer the ignominy of moving in with her mother (Patricia Hayes). Little is known about this oddity of a sitcom, but episodes appear to focus on Marjorie's desperate attempts to snare herself a new man. As a sitcom there are, naturally, plenty of misfortunes awaiting Marjorie and these generally take the form of her mother or disastrous dates. It's certainly not re-inventing the genre, but it's hitting all the right beats for lighthearted sitcom frivolity. And Timothy West and James Cossins pop up, so with a formidable cast in place it's surely worth a watch. By the late 1990s, Chris Barrie's stock in the sitcom world had shot up with some ferocity following the wildly popular Red Dwarf and The Brittas Empire. They were both vastly different roles and demonstrated Barrie's keen knack for inhabiting a character and bringing them to life with admirable vigour. Following up these iconic shows would be a tough ask, but could Barrie pull it off with A Prince Among Men? Gary Prince is a much loved ex-England footballer who's managed to continue his success off the pitch by transforming himself into a successful businessman. He's got a natural thirst for success, but this is sometimes at the expense of his dysfunctional marriage to Lisel Prince (Francesca Hunt). Despite Barrie's fine pedigree, however, he was powerless to stop A Prince Among Men being a disaster; even Barrie himself has admitted that A Prince Among Men was a low point in his career. And it's not hard to see why. Barrie's natural confidence gives Gary Prince an assured foundation, but the scripts only ever manage to eke out an underwhelming narrative; this leads to the character being robbed of any warmth. The problem is that he's an irritating chump, but without the depth and pathos of Rimmer or the whirlwind like chaos coursing through Gordon Brittas' veins. Inexplicably, a second series of A Prince Among Men was commissioned, but this did little to muster any support for the show. It was Barrie's last original sitcom role and, since then, he's only returned to Red Dwarf. So, what other forgotten sitcoms can you remember which star some of the biggest names in British comedy? Let me know in the comments below! The Losers with Leonard Rossiter and a young lad called Alfred Molina. Come back Mrs Noah, which united Molly Sugden, Ian Lavender, Gorden Kaye and the two upper class twits from It Ain't Half Hot Mum, so garnering talent from Four of THE Great British Sitcoms. The pilot was dire but it got a series, which was dire, and even a second series, which was really dire! Let Them Eat Cake from 1999! I loved Sirens, don't think it was on that long ago - maybe 2010/11? I remember the critics gave it a bit of a kicking, but there was something special at its core which deserved a second series. 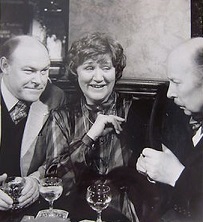 Sorry to bombard you but there was one with Hylda Baker who moves south to run a London pub. Had 2 outrageously stereotypical gay male characters but remember little else. 1976 I think.